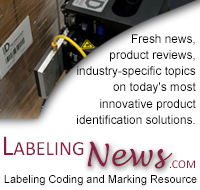 ID Technology - powered by Pro Mach, a leading provider of labeling, coding and marking solutions, will be featuring a high speed wrap labeling system from LSI, their Labeling System and Integration arm, at Pack Expo International; booth N-5406. The system is capable of applying a label at speeds of 200 products per minute or more. A feedscrew is used to feed products into the system and a wrap belt rolls the product along a back-up plate, wrapping the label around the circumference of the product. Prior to label application an ID Technology Compact 32d Thermal Transfer Overprinter is used print lot and expiry date information on each label. A vision system and a luminescence sensor are used to verify the lot and expiry date information and that a label is present on the product. Products with bad or missing labels are tracked through the system to the reject station. Products that pass all inspections transfer onto the downstream conveyor via side transfer. Interface to the control system is two full color touch screen HMIs. All controls are Allen-Bradley and PackML compliant. Changeover is recipe driven.